When I was younger, I had this friend. We were like bffs. We had a lot in common. We went to the same school, we each had a sister three years younger than us, we were in the same girl scout troop, we went to the same youth group, we liked the same music, we liked the same cartoons, we liked the same games, we had the same hair, we even had doubles of the some of the same toys. In fact, if something wasn't totally equal between us it could cause problems. We used to wish that we were twins. This all started when strangers would ask us if we were sisters. We took their makeshift conversation too seriously. One day, as my mom came to my friend's house to take me home, we got a "bright" idea. We decided to trade clothes and see if our mothers would confuse us. We were hoping that we would pull off something similar to the parent trap. It didn't work, obviously. Since we're on the subject of children behaving normally, I might as well mention our favorite toys. Barbie dolls! Just kidding. We weren't normal children. 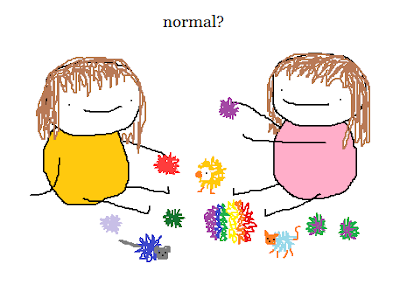 Our favorite toys were useless balls of plastic strung together known as Koosh balls. And no, we did not use them for their intended purpose, throwing at other children. We gave them names and made them into characters. We had an entire three generation family of Koosh balls. And if that's not absurd enough, we thought it would be hilarious to name the males with female names and vice versa. 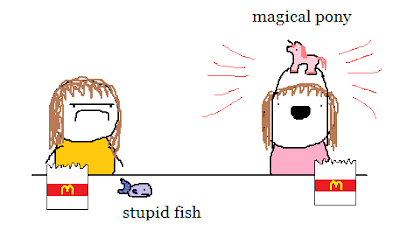 For example, the famous red girl Koosh named Bob that I would take with me to school. The gigantic rainbow grandpa Koosh named Stephanie. Some had animal heads and limbs. There was even a pair of green and purple twins. Eventually we ended up going to different middle schools and our interests changed. 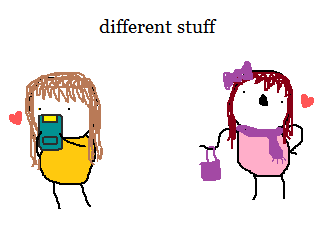 Friend was into fashion and became awesome and I obsessed over video games and became anti-social. But being bffs with her made being a kid super amazing. This is amazing, I'm reading your stories with as much interest as my girlfriend listening to Big Brother on TV! 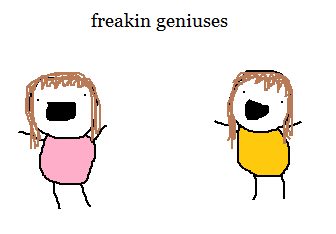 Your drawing make this all cute and the Freakin Geniuses parent trap made me laugh pretty hard! Keep up the good work! Would you mind if I share your blog on my twitter? You should of COURSE share her blog. Her hilarious life should be shared with the world. GREAT POST!! I truly enjoyed reading this!! Not often you see such good original content.